According to CMS, the biggest Medicare Advantage (MA) enrollment gains during the 2018 Medicare Annual Election Period (AEP) came from UnitedHealthcare (+388,600), Aetna (+246,078) and Humana (+214,995). With some help* from Mintel, we took a look at some of the direct mail (DM) and print marketing tactics used by each of these insurers in their Medicare marketing and found some common themes, as well as a few unique approaches. While these marketing elements play a part in each brand’s enrollment growth, we acknowledge that there are many non-marketing factors that contribute to plan growth. The structure of Medicare plans themselves play a critical role in determining the number of enrollees, with factors ranging from pricing and plan benefits to the plan’s provider network. Additionally, market competition, sales force experience and broker commission/incentives, accessibility to retail locations and mergers & acquisitions are all important non-marketing determinants when it comes to enrollment growth. 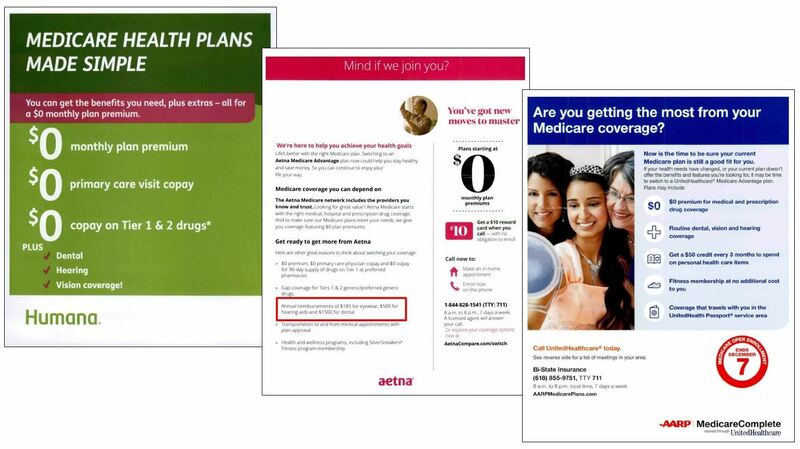 Aetna makes use of the same strategy with its DRTV spot. 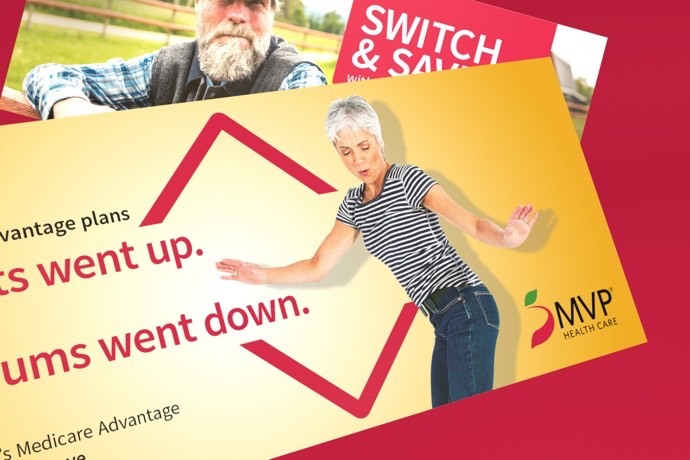 The insurer uses the message “Moving Medicare Forward” and paints a picture of an active woman who won’t let her age slow her down. According to Deft Research, “along with drug coverage, dental coverage stimulates the most shopping among seniors.” Why? Dental coverage for seniors is often very poor. Many plans fail to cover most dental care, dental procedures or dental supplies, like fillings, dentures or dental devices so dental issues often go unaddressed. Therefore, plans that offer dental coverage (and address similar needs, like vision and hearing care) are attractive to seniors new to Medicare and those who are shopping for new plans. UnitedHealth and Humana both feature dental, hearing and vision coverage in their AEP creatives. Aetna gets more specific and takes it to the next level. The insurer offers $0 copays for routine dental, vision and hearing exams. It also offers annual reimbursements for dental, eyewear and hearing aids – a message communicated effectively in its print pieces. Takeaway: If you’ve got it, flaunt it. While plan benefits and offerings aren’t factors that marketing teams have control over, marketing campaigns can – and should – promote coverage options that resonate with consumers and differentiate you from your competitors. Research shows that seniors are interested in dental, vision and hearing benefits. 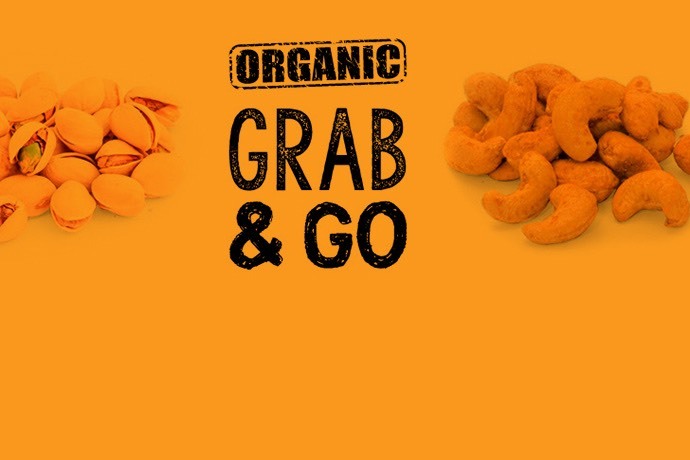 If your plan offers it, your marketing should reflect that. Often, a successful marketing strategy is born when you tap into a vein that your competitors do not. 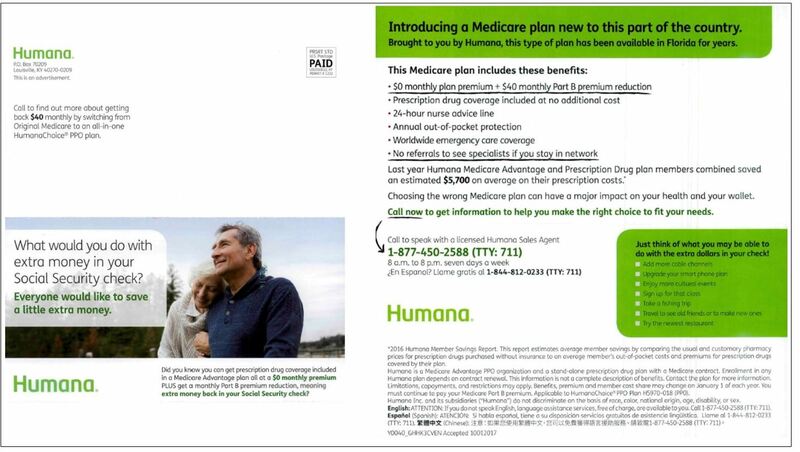 Humana did so in highlighting its Humana Choice® (PPO) plan, available in certain states. The plan reduces participants’ Part B premium by $40 each month, which is added to their Social Security checks. In the copy in the DM piece below, Humana offers members suggestions on what they can do with that extra $40. In using this approach, they successfully answered the question: “What makes you stand out?” Takeaway: Money talks and cost is one of the important factors when it comes to picking a plan for the Medicare audience. If you offer a product with a cost advantage, find a way to highlight it to attract seniors. Our Medicare Insights Direct Mail Messaging survey delves in deeper. Sometimes, doing things differently can lead to positive results; in this case, increased Medicare Advantage enrollment year-over-year. This past year’s successful Medicare marketing campaigns attempted to stand out from the crowd by featuring a combination of bold messaging, marketing savvy, unique features and new creative marketing pieces coupled with common, battle-tested themes. *Direct mail communications (screenshots) sourced from Mintel – a world leading market intelligence agency.